A Russian lawyer said she was summoned to Trump Tower during last year's presidential campaign to meet with Donald Trump Jr. and asked if she had damaging information on Hillary Clinton, according to an interview aired Tuesday by NBC's "Today" show. The lawyer, Natalia Veselnitskaya, told NBC she received a phone call from a man she didn't know and was told to meet with Trump Jr. She says she didn't have information on the Clinton campaign and has never worked for the Russian government. "All I knew was that Donald Trump Jr. was willing to meet with me," she said through a translator. On Clinton, she said: "It's quite possible that maybe they were looking for information. They wanted it so badly." The interview is Veselnitskaya's first public comment since Donald Trump Jr. acknowledged that he made time for the meeting hoping to get information on Clinton, his father's Democratic presidential opponent. The president's son has said the meeting was arranged by an acquaintance he knew through the 2013 Miss Universe pageant Trump held in Moscow. On Monday, Trump Jr. tweeted sarcastically, "Obviously I'm the first person on a campaign to ever take a meeting to hear info about an opponent ... went nowhere but had to listen." According to the NBC interview, Veselnitskaya suggested she didn't initiate the meeting; she says she was lobbying against U.S. sanctions affecting Moscow but wasn't acting on behalf of the Kremlin. She said Jared Kushner, Donald Trump's son-in-law, also attended the meeting but left after a few minutes. Paul Manafort, then Trump's campaign chairman, was there too but never participated and spent much of the meeting on his phone, she said. It wasn't clear from the NBC report who in the meeting asked her for information on Clinton. The circumstances surrounding the meeting, and a report by The New York Times late Monday that Trump Jr. was told ahead of time that the Russian government was the source of damaging information on Clinton, have fueled new questions about the Trump campaign's possible ties to Moscow, which are being scrutinized by federal and congressional investigators. Lawmakers on the committee from both parties said they indeed wanted to talk with the president's son. Rep. Adam Schiff told CNN the report, if true, represents "an offer by the Russian government to help interfere in the American election on behalf of one of the candidates" and the first time "the inner circle of the Trump family...have direct contact with the Russians promising" information on Clinton. Sen. Susan Collins, R-Maine, said the panel "needs to interview him and others who attended the meeting." The sequence of events that led to the June 2016 meeting highlighted the tangled web of relationships that investigators now are sorting through. In the interview with the AP, Goldstone confirmed he set up the meeting on behalf of Agalarov. Goldstone said the Russian lawyer, Veselnitskaya, stated that she had information about purported illegal campaign contributions to the Democratic National Committee that she thought Trump Jr. might find helpful. Goldstone said Trump Jr. agreed to squeeze the meeting into a tight schedule. Dmitry Peskov, a spokesman for Russian President Vladimir Putin, said Monday the Kremlin doesn't know Veselnitskaya and "cannot keep track" of every Russian lawyer who holds meetings in Russia or abroad. 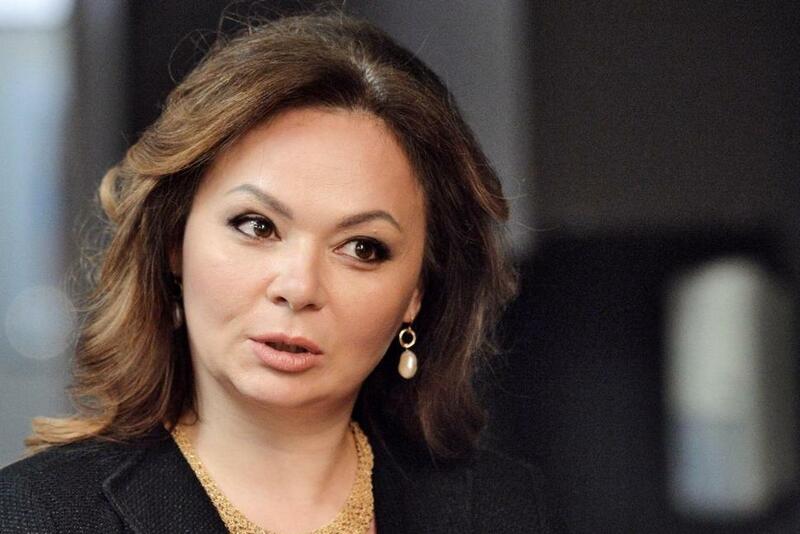 Although she has not been publicly linked with the Russian government itself, Veselnitskaya represented the son of a vice president of state-owned Russian Railways in a New York money-laundering case settled in May before a trial.